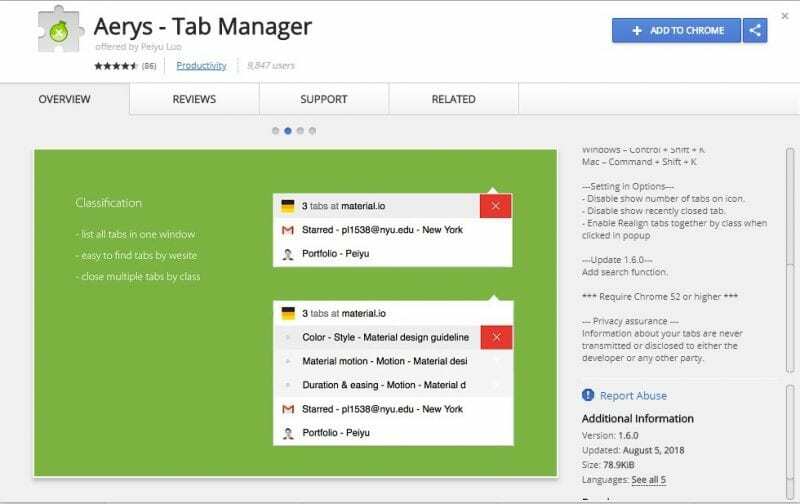 To make things easier and to handle the tabs without any hassle there are many chrome tab manager extensions out there to sort it. 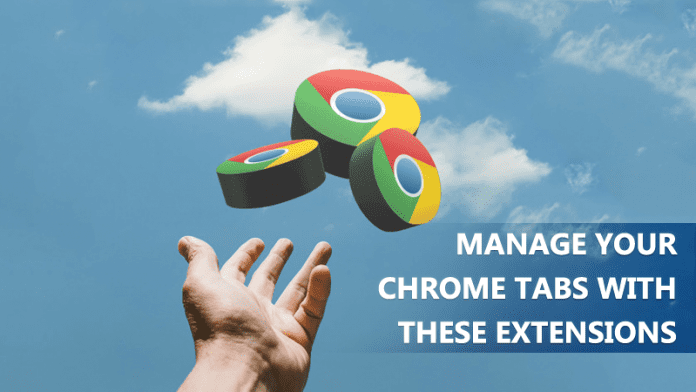 Here in this article you will know the best chrome tab manager extentions that you can use to manage the tabs in the browser. We all use Google chrome on daily basis nearly and we also know that the google chrome is one of the best and most popular browser. As we know that we can open many tabs in the browser and same can be done for google chrome also but to make the things easier and to handle the tabs without any hassle there are many chrome tab manager extensions out there to sort it. 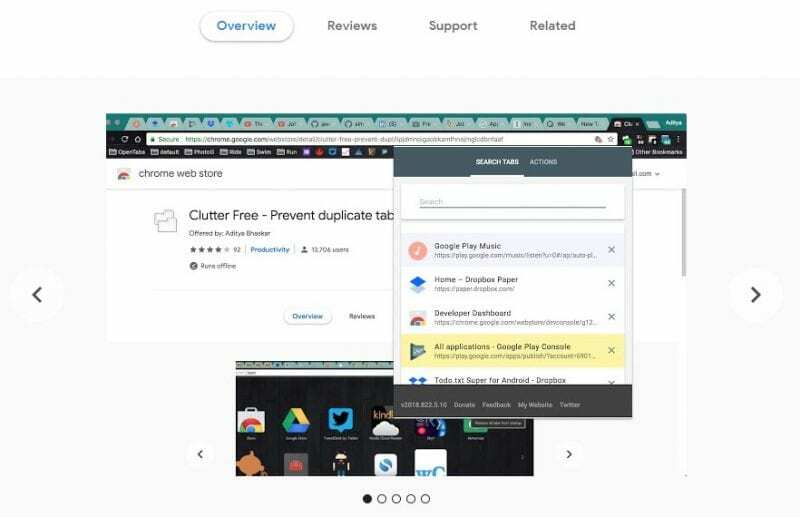 So below are the some of the best chrome extensions that you will love to have in your browser to manage tabs in it. It makes using up multiple chrome tabs very easy task as it shows a preview of all the open tabs when clicked on its toolbar icon all you have to do is to select any one of it that you want access to.There is also a search bar that you can use to quickly search the tabs through their title names.The interesting feature of this program is that it can automatically backup/restore active tabs to your Google Drive account and other than that the idle tabs can be accessed and organized via separate column. 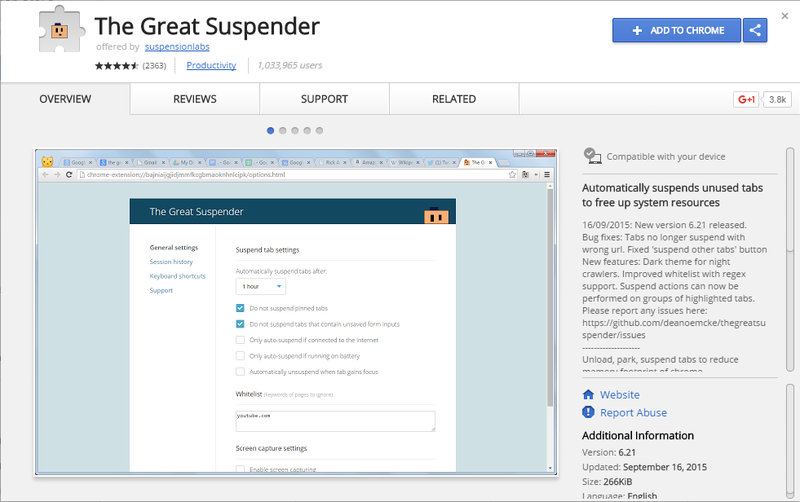 It is the best chrome extension that you can find to use for extending the google chrome tabs and this program is also open source hence you can find it easily on a network for downloading.If you want the unsaved tabs,pinned tabs etc to be managed easily then The Great suspender is the best one as it can also check whether these tabs are suspended or not. Amazingly designed for super easy use this extension can not only manage multiple chrome tabs but can also manage multiple chrome windows.In its toolbar, Tabli shows the listing of all the open tabs grouped by chrome windows in which they are open.Tabs in chrome windows can be saved for later use and it can save about a group of tabs also as bookmarks. 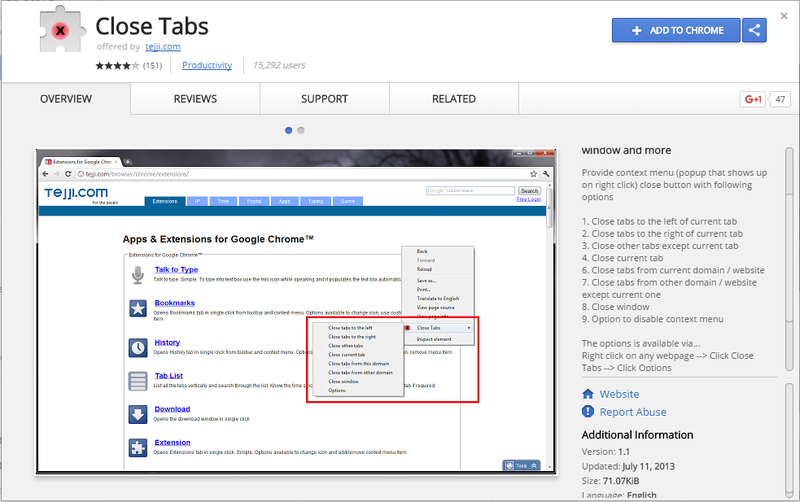 One of the simpler extensions that you can use for managing Chrome tabs. It can display the open websites via their favicons that you can click on to jump to the corresponding tab.You can further change its layout to display a vertical listing of open tabs’ titles.The quick access buttons like pin tabs,open new chrome windows, the search bar will also make your task much easier. It is the most powerful Chrome tab management extensions that are available right now.It constantly keeps the check on the active browsing sessions and lets you save or restore them by just a click.Session buddy can also store the information of different sessions in many formats like JSON,HTML, and CSV.You will also get some extensive tweaking options and use those you can configure everything from session names to maximum session counts that can be saved also.The ability to hide/duplicate tabs and keyboard shortcuts also make it exceptional. 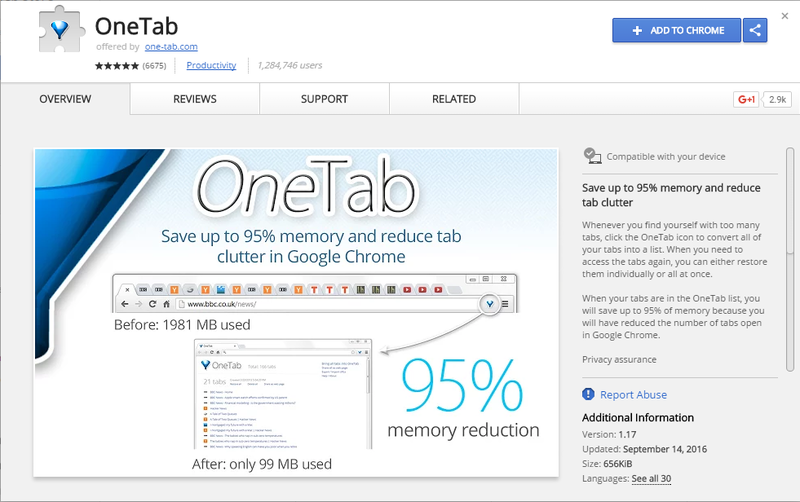 It can handle up many tabs all in one by converting the all open tabs into a list from where they can be restored also either one at a time or all at once.OneTab quickly frees up the memory taken by the chrome tabs. Therefore, the multiple tabs can be worked on easily with fast responsive speed.Multiple tabs can also be saved /restored as a group and you can also specify options to include/exclude certain tabs from one tab. A very simple design that you will surely get the hang on once you got familiar with it. Tab Outliner displays all the active tabs in a tree like structure and you can also drag and drop text from web pages to the tab list so as to create short notes hence making the management easier. It provides the hover over like buttons that can perform actions like cloning already open tabs and even opening the Google Documents. A quick way to find the tab you’re looking for when you have lots of them open. 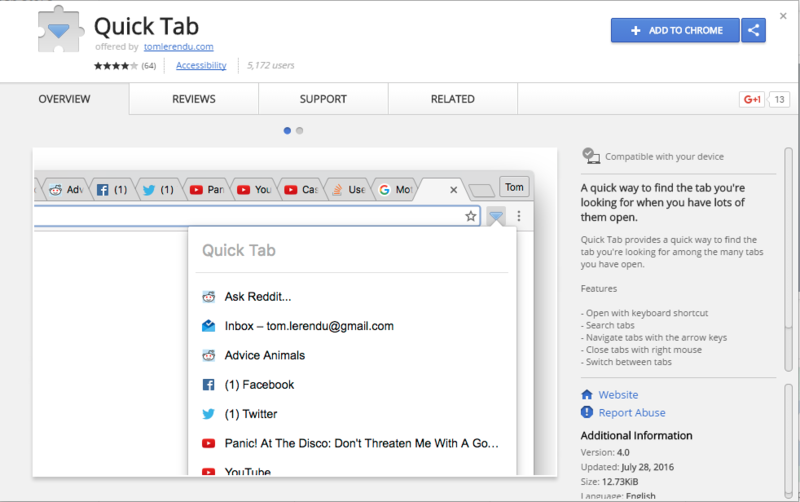 Quick Tab provides a quick way to find the tab you’re looking for among the many tabs you have open. Context menu to close – tabs to the left, tabs to the right, other tabs, tabs from the same domain, current tab, window and more. Provide context menu ( the popup that shows up on right click) close button with options like Close tabs to the left of the current tab, Close tabs to the right of current tab, Close other tabs except for current tab etc. 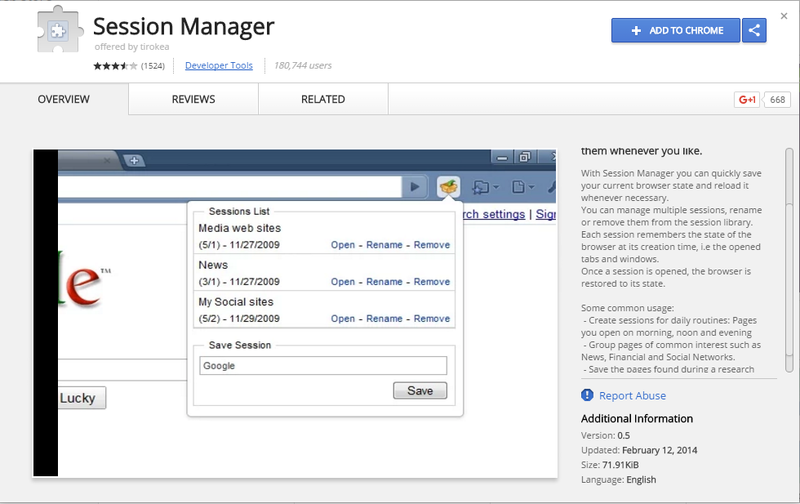 Session Manager lets you save sessions of your opened tabs and windows, and to quickly re-open them whenever you like. 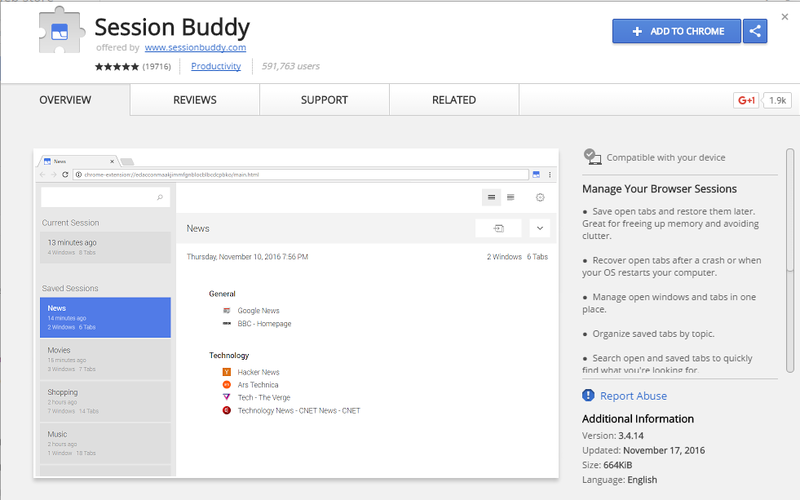 With Session Manager Extension you can quickly save your current browser state and reload it whenever necessary. Tab Hibernation frees some memory and CPU on your computer by killing all inactive tabs. Your tabs won’t get lost and you can restore them with a single mouse click. Once installed, users will notice a button in the shape of a crescent moon at the end of the address bar. This extension displays your recent history, recently closed tabs, most visited pages and recent bookmarks in a one click pop-up. Users can change the number of items and can change the width of pop up menu. 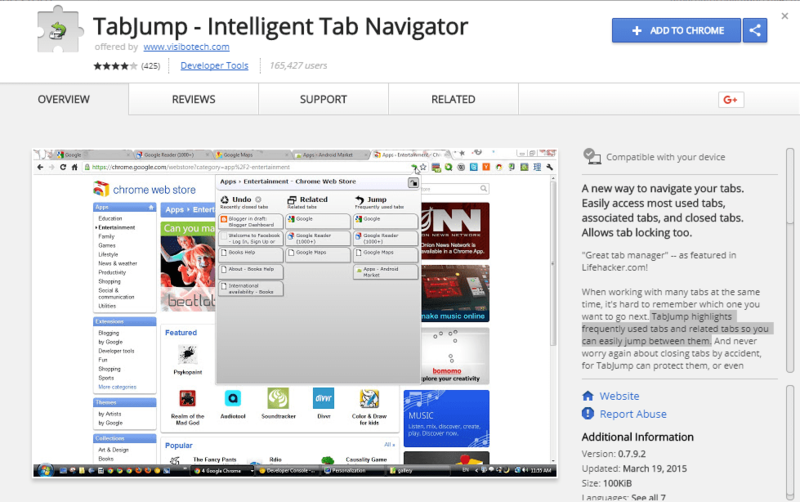 TabJump is a new way to navigate your tabs. Easily access most used tabs, associated tabs, and closed tabs. Allows tab locking too. 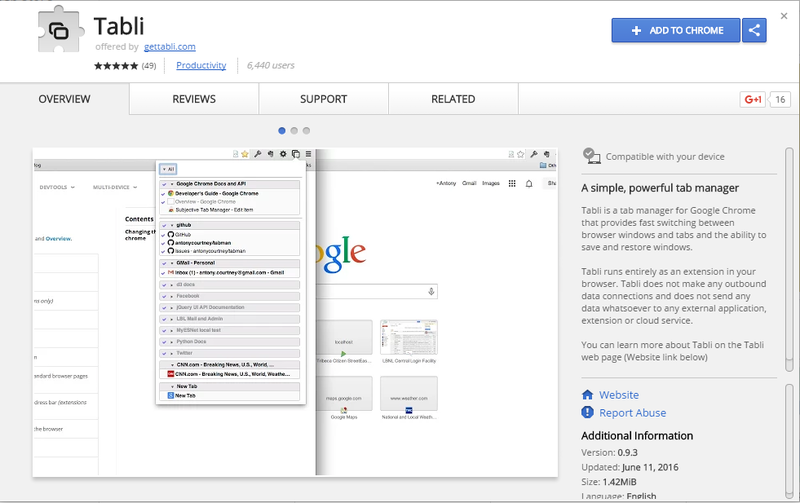 TabJump highlights frequently used tabs and related tabs so you can easily jump between them. 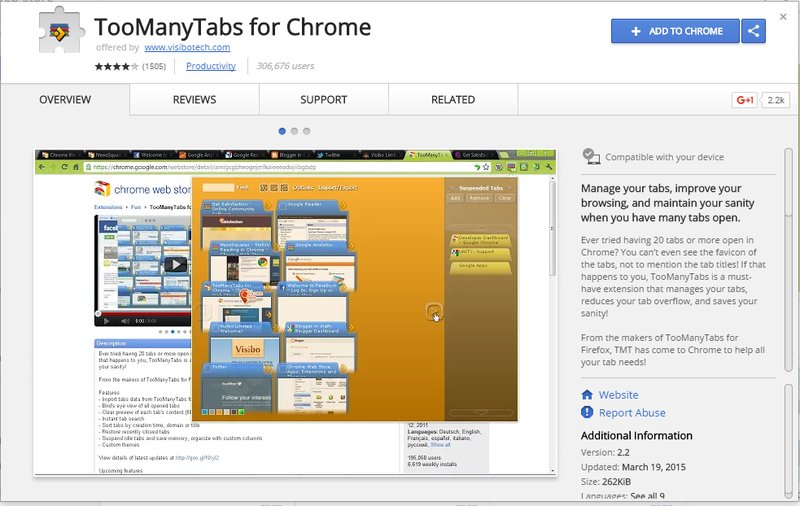 Aerys – Tab Manager is one of the best Google Chrome tab manager which gives you a clear view of all open tabs. The best thing about Aerys-Tab Manager is that you can search all opened tabs, click to jump pages, show recently closed tabs and much more. The tab manager comes with a great interface and it doesn’t feel heavy on the browser. 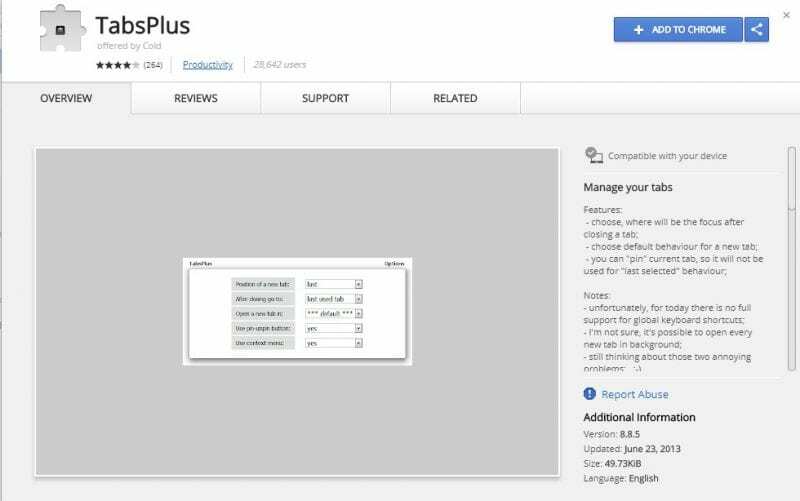 TabsPlus is another best Google chrome extension which allows users to set preferred actions. For example, you can change the position of a new tab, you can set simple behavior modification that forces the browser to open the last selected tab whenever you close a tab. The extension is very lightweight and it doesn’t feel heavy on the browser. 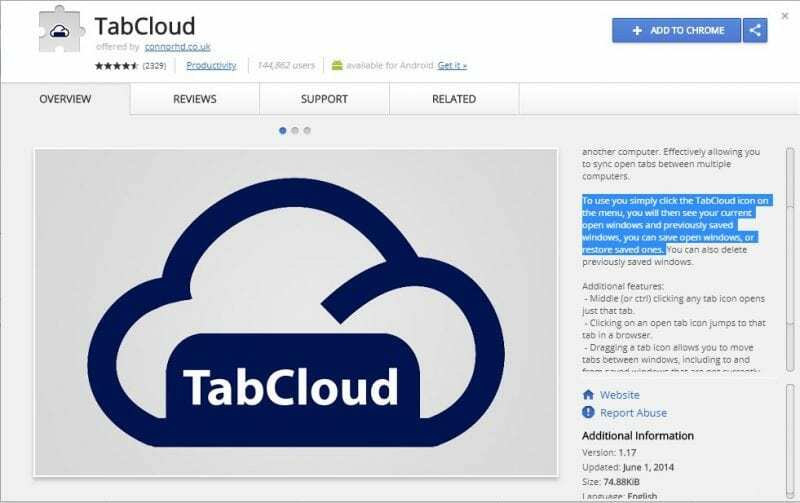 Tab Cloud allows you to save any window session and restore it at a later date or on another computer. Effectively allowing you to sync open tabs between multiple computers. To use you simply click the TabCloud icon on the menu, you will then see your currently open windows and previously saved windows, you can save open windows, or restore saved ones. 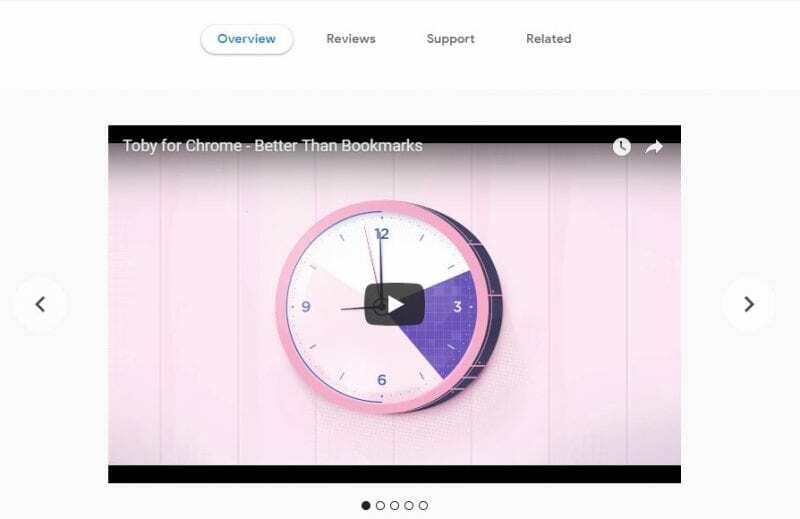 Well, if you are looking for the best Google Chrome extension that can do a little more than just organizing the tabs, then Toby might be the best one for you. With Toby, you can save, suspend and organize tabs according to your wish. The great thing about Toby is that it level ups the Chrome Browser. Not just that, but it also allows users to add new tabs by dragging and dropping your browser tabs into the collection. 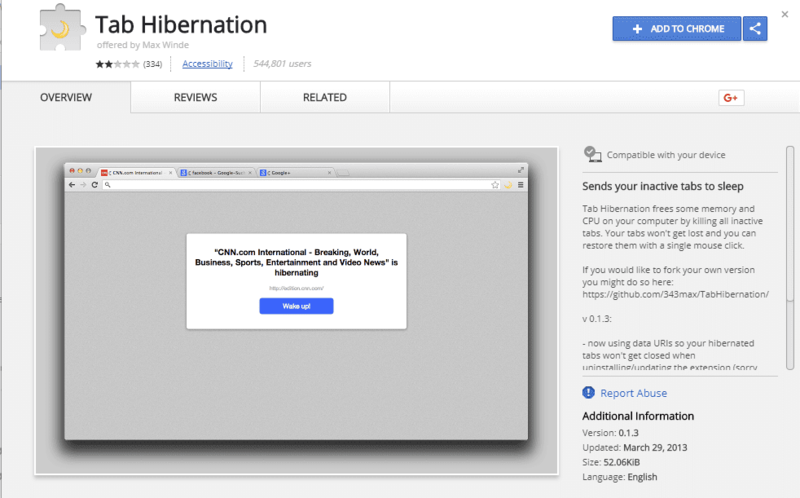 This is one of the great extension that every Google Chrome users should use. 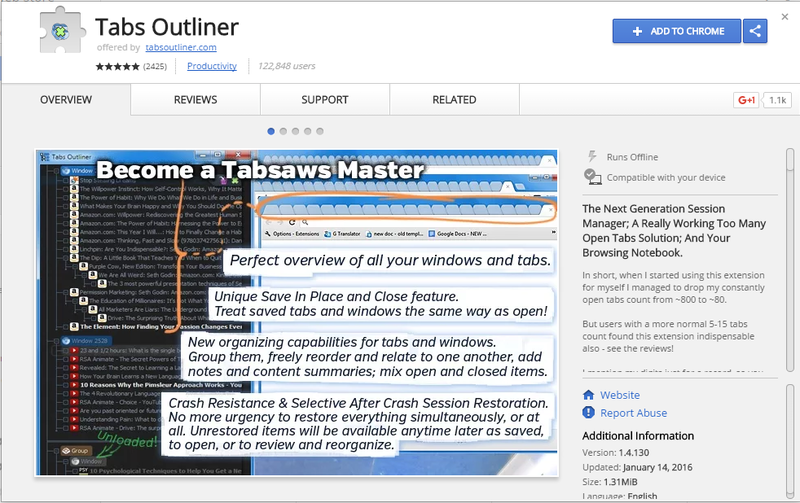 The extension reduces the tab clutter by avoiding duplicate tabs. The great thing about Clutter Free is that it automatically detects and closes the duplicate tabs before they open. 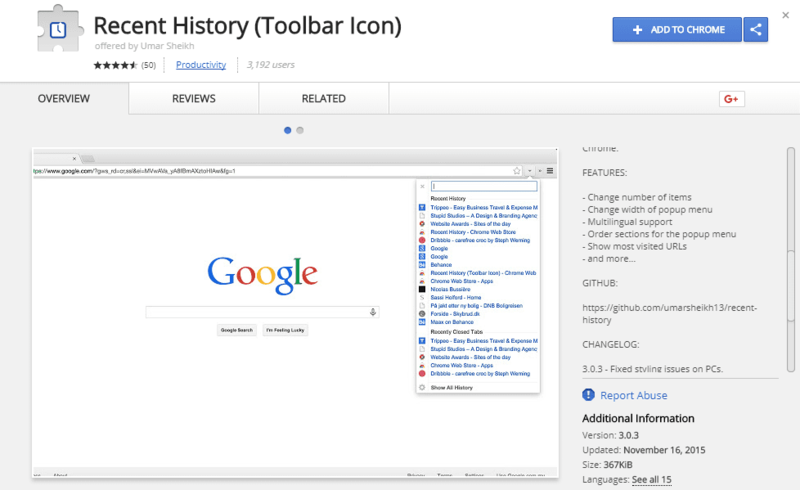 So, its one of the best Google Chrome extension that you should use. 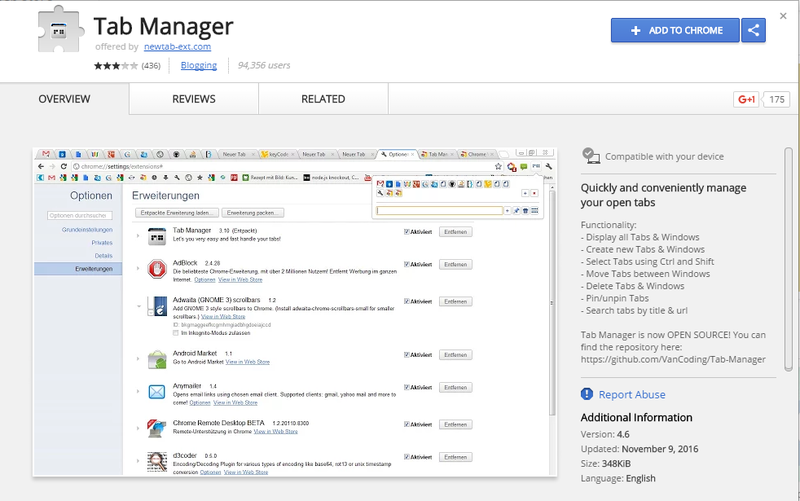 So these are 20 Best Google Chrome Tab Manager Extensions. Things get much easier if one could get some help from others. For helping you in managing chrome tabs there are many extensions available but the best one’s that are listed above are the most preferred. Go on with any of these and you will find them to be a great time-saving deal.